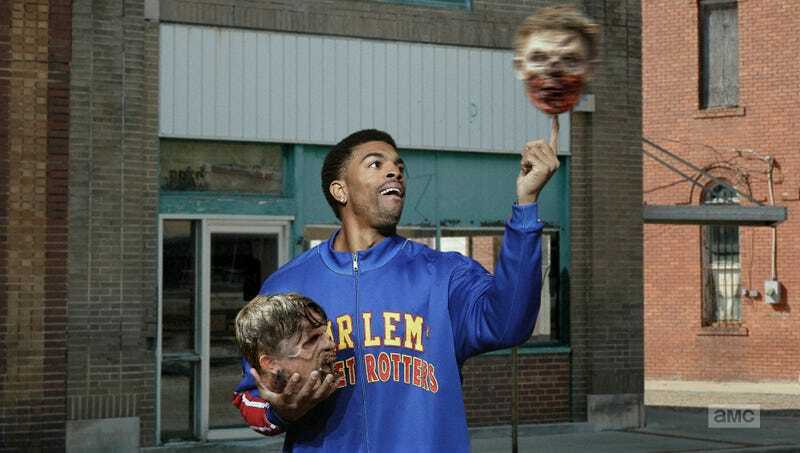 ATLANTA—Noting that late-season gimmicks have often had dire results for past series, fans of zombie drama The Walking Dead found themselves divided this week concerning a recent crossover episode featuring legendary basketball team the Harlem Globetrotters. “It was a nice touch of whimsy when the Globetrotter’s bus broke down near the containment wall, but honestly, it also kind of seems like they’re running out of ideas,” said longtime viewer Albert Garcia, who said he enjoyed the scene in which Rick Grimes and Curly Neal foraged for supplies in the ruins of an abandoned basketball arena, but also felt the storyline lacked the emotional gravitas that has come to define the show through its first nine seasons. “I’m not really sure how I felt about the part where the Dizzy took off a zombie’s head and spun it on his finger. That said, I did chuckle when Big Easy doused Negan with a bucket of confetti. Overall, though, it seemed a little desperate. And, naturally, it was kind of a bummer when that one racist character came back to kill them all at the end.” Fan reaction to the episode seemed almost unanimous, however, in that the Globetrotters’ appearance on The Walking Dead made far more sense than than the exhibition basketball team’s central, pivotal role in the 2009 series finale of Battlestar Galactica.